It has been forever since I posted a recipe on here, but I'm sort of making peace with my for now inadequate digi software. Life must go on and all that. 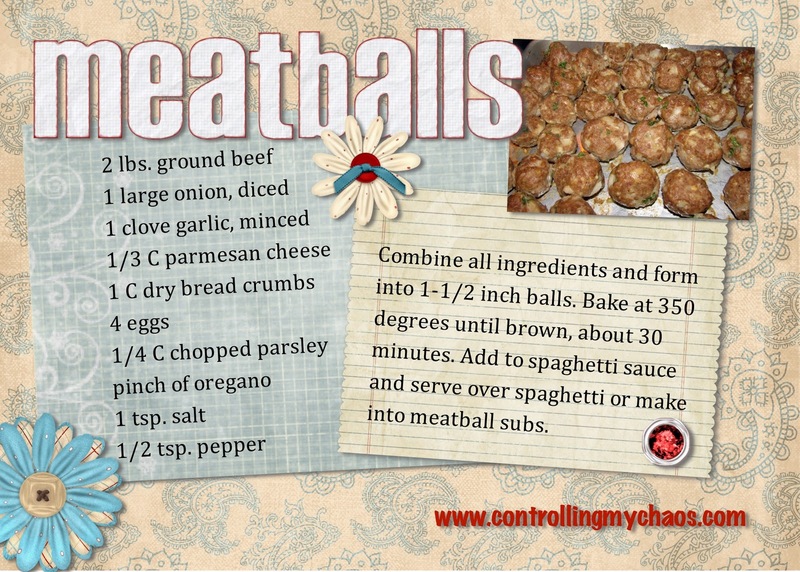 This recipe for meatballs is another of the many recipes given to me by my mother-in-law, the Barefoot Contessa. It's super easy to make, and it makes plenty to freeze for future meals. I love that part. All you need to make it is: ground beef, onion, garlic, parmesan cheese (the cheap stuff in the green can is fine), dried bread crumbs, eggs, parsley, oregano, salt and pepper. The first step is to simply combine all the ingredients. I like to use food prep gloves because squishing raw meat together creeps me out. Keeping the gloves on, the next step is to form the meatballs into 1-1/2 inch balls. I don't measure them or anything, but I make them into a size that seems good to me. When Peanut Head helps he makes them a little smaller so they go farther. I will not make a joke about that. Actually, I just did but then I deleted it because it wasn't appropriate. The Barefoot Contessa browns her meatballs in oil, but I'm lazy so I just pop mine in the oven on a cookie sheet for 30 minutes or so, and they turn out great. In fact, I dare you to not sample them when they come out of the oven. The smell will make you whimper, I promise. We always have spaghetti and meatballs the night we make these. Usually we spoil our dinner because we overindulge when sampling the meatballs. There's always plenty to freeze several baggies full of meatballs for future spaghetti nights in a flash. They make good meatball subs too. Here's the recipe card. Remember to click on it before saving it to your computer so you get the best resolution. Trust me. Those look amazing! I will have to try that next time I make meatballs. Thanks for sharing! I love meatballs and do mine the very same way! these look delish.. I have made a great meatball soup, with orzo, carrots, celery and meatballs. At our house we sometimes make a teriyaki meatball with yoshida sauce and pineapple mixed in. I LOVE your recipe cards! and ha! to the barefoot contessa because I didn't even know i you could brown them in olive oil, I am always just popping them in the oven. I'm a shortcut junkie I guess. I take string cheese and cut it up into little coins. 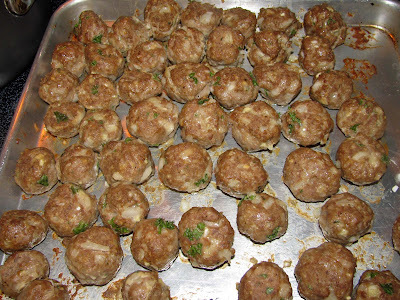 After you make the meat balls, push a piece of cheese inside and re-roll them into a ball. Bake and freeze. When you cut into them the cheese oozes out. YUMMY!! I love you recipe cards - how do you make them? Do you design your own or do you have a program that does that for you? (a tutorial on how to make them and post them would be awesome btw!) I have recently started reading your blog regularly and I am am really enjoying it. You have so many cute ideas! sounds delicious! at what temp? I haven't made meatballs in forever! How do you reheat after freezing them? I just defrost them in the fridge and then either reheat them in marinara sauce or microwave them. Shared this on my blog!! Thank you so much for sharing this recipe! This looks delicious! I love the idea of baking the meatballs instead of frying them. I also found a kindred spirit--I will not touch raw meat! If I'm out of gloves, I use baggies! How many meatballs will this recipe make approximately? I have a small family and small freezer. Thanks! It depends on the size of your meatballs. I bag them in quart size bags of 10-12 and I usually get four or five bags. Amazing,my family enjoyed or I should say loved them so much. These are WONDERFUL!!! These have become my go-to meatballs, and every two weeks, when we go shopping, these are on the menu. The only thing I do differently is switch out one pound of ground with sausage. It's very flavorful and makes for easy lunches, too. I loooove these! Thank you so much! (I did try browning them the first several times. I *finally* ran out of time one night and didn't brown them - I can honestly say, they're better when I don't! They come out of the oven quite perfectly browned, but heat more evenly, I think. And less work! (Did I mention I love this recipe?!) Making this again tonight and figured I owed you a "thanks!"